JUST TAP: The new video course for beginner tap dancers! 2015 was a relatively quiet year for Red Hot Rhythm. While there were plenty of fun times to be had, the year consisted primarily of quiet contemplation as we were forced into some rather grown-up decisions about the future of the RHR adventure. 2016, I am hoping, will be a rather special year, the reason being: after spending the bulk of the last 18 months planning, thinking (and over-thinking), worrying, doubting and slowly breathing several projects into existence, 2016 will finally see them released out into the world. An exciting new video introduction to the art, technique and magic of tap dance, crafted with care and expertise for: Beginners. …of course, there’s a video! ‘JUST TAP’ was an idea that sat in the back of my mind for years. The Absolute Beginner Tap Course was always one of the most heavily attended classes we held at Red Hot Rhythm, and for a long time, I have wanted to make it available in a high-quality video course format. 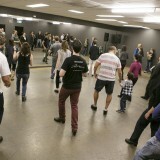 Over the years, I’ve spoken with many people who long to give tap dance a try, but who either don’t feel quite ready to jump into a class with a bunch of strangers, or who simply don’t have access to quality tuition for beginners. I have set out to provide the most effective, concise and relevant introduction to the art, technique and magic of tap dance possible, and after almost a year of planning and development, I’m really chuffed to say: I think I’ve succeeded. But I’m not getting carried away just yet…because it’s not quite finished. It will be soon though. I’m in the process of putting the finishing touches on the Absolute Beginner Course, which will be making its way into the world within the next 2 months. Following that, I’m planning a 2nd course for Advanced Beginners (tentatively, to be released mid 2016 if I can manage my time efficiently enough), and hopefully, an Intermediate/Advanced course at a later date. I’ll be releasing more information over the coming months, as well as a super-duper good launch discount offer that will be available for a limited amount of time. If you or anyone you know have a quietly burning desire to have a crack at this incredible art form, I feel this 3-part course is a perfect first step to take, with a price point well under the cost of a single private class. Stay tuned, and please feel free to share it around! Check out the website, and if you’re interested, be sure to sign up to the special ‘JUST TAP’ mailing list, where I’ll be sending the main updates and special offers. I have recently finished watching and practising along with your Absolute beginners Tap course. It was fantastic! I had so much fun. 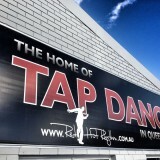 It was awesome as I used the basics to learn some other tap moves which was fun. Later in November i’m actually in a Musical, with the Church ‘Hosanna Excelsis’ and I have to do a little bit of tap dancing so your video has helped me a lot! Thank you so Much! I was wondering is that available for purchase yet, if so how much is it? But if not when do you think it will be available to purchase? I looking forward to learning more tapping! That’s fantastic to hear – thank you for messaging! I’m happy to say that the new course is on the way 🙂 I’ll be making the official announcement in the coming weeks. Stay tuned! Thanks again, and happy tapping!